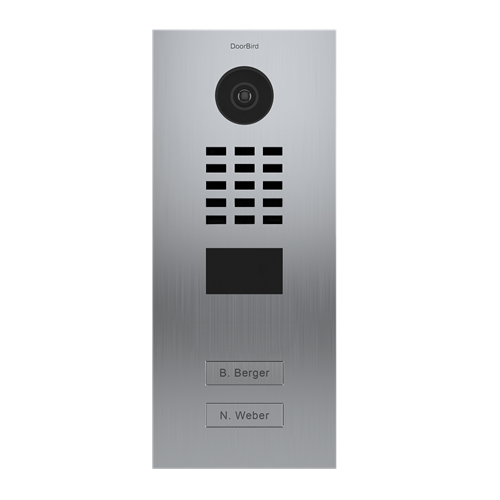 The DoorBird D2102V is a multi-tenant IP video door intercom with support for 2 apartments, with 2 call buttons. Each call button can be assigned to one or more user(s) to receive a push notification on the DoorBird app when their respective call button is pressed. Motion based alerts may also be sent for proactive notification and security. DoorBird users can answer the door from anywhere in the world using their Internet connected iOs or Android smart phone using the free Doorbird app. Users can also check live video or recorded images/video any time proactively. 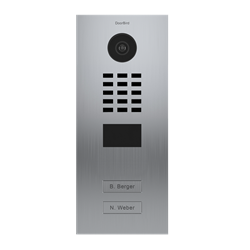 Users can listen in, or have a two way voice conversation with the vistor or intruder using the built in high definition colour video camera, speaker and microphone. The on board camera captures 720p colour video during the day. When it gets dark it automatically switches to night vision mode with night vision provided by the built in infrared LEDs.